If you’re looking for the best brush for Golden Retrievers, you’ve come to the right place! The Golden Retriever is one of the world’s most coveted dog breeds. And with those beautiful golden locks and friendly personality, it’s easy to see why. So, if you are a Golden Retriever owner, you may be wondering how you can keep your Goldie looking as good on the outside as they feel on the inside! While routine professional grooming can be a great way to ensure your Golden Retriever is as shiny as their name. But the truth is, you don’t need to spend big bucks to keep your pup looking pampered. With the right tools, your Golden Retriever can look spa-fresh even between grooming appointments! Would you like to learn how? Keep reading! Do You Need to Brush Your Golden Retrievers? Like all double-coated dogs, Golden Retrievers will need routine brushing to keep their coats and skin healthy. 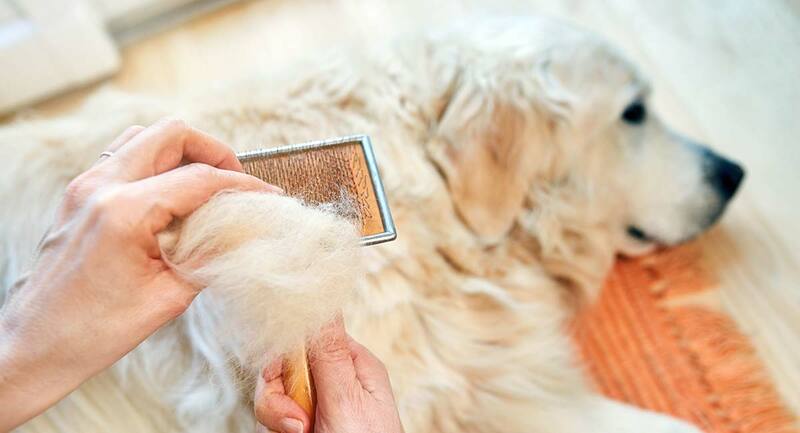 Golden Retrievers naturally shed heavily and regular brushing with high-quality tools will help to keep all that loose hair from your furniture and house. In addition to keeping your Goldie (and home) looking and feeling good, regular brushing can give you some insight into your dog’s overall health. Brushing allows you to keep an eye out for bumps and abrasions on your dog’s skin that you may not have noticed otherwise. But before you begin brushing your Golden Retriever all willy nilly like, let’s talk fur. What Type of Fur Do Golden Retrievers Have? As we mentioned above, Golden Retrievers are a double-coated breed. This means they have a harsh water-resistant outer coat to protect them from the elements, and a thick woolly undercoat to keep them insulated. The undercoat protects your Golden Retriever from both the cold weather and the warm weather, ensuring they are warm in the winter and cool in the summer! For this reason, it is best that you do not shave your Golden Retriever. Their gorgeous golden coat can grow long and will often need to be trimmed. However, shaving your pooch or giving them a wacky haircut could actually leave them susceptible to heat stroke and sunburn during warmer months. And during the colder months, shaving your Golden Retriever could leave them vulnerable to hypothermia. With that duly noted, let’s discuss routine. Most groomers and Golden Retriever experts recommend a monthly grooming session for your Goldie. But what about brushing? Let’s find out! How Often Should You Brush Your Golden Retriever? For the most part, Golden Retrievers are naturally clean dogs—their skin produces natural oils that help to protect their double-coat and keep their fur healthy and shiny. However, you will need to brush your Golden Retriever regularly owing to the amount they shed. This typically means at least once a week. But during shedding season, sometimes once a day. Shedding season is usually the Spring and Fall months. Your dog will either be shedding their heavy winter coat to keep cool or shedding their summer coat to make room for warmer fall fur. Either way, de-shedding is going to be essential, especially during these months. If left unattended, loose hairs may become caught in your Golden Retriever’s undercoat and outer coat, leading to painful matting, tangles, odor, and even infection. That’s why it is always important to stay on top of your Golden Retriever’s brushing regime. Brushing on a regular basis will also help control the amount your Golden Retriever sheds, meaning there will be less loose hair on your clothes and furniture. Alright, so now that we have gone over the importance of a brushing your Golden Retriever, let’s talk about the importance of using the right brush. Your Golden Retriever’s double-coat is going to require a few types of brushes and combs depending on the time of year. This will also depend on whether there is any matting or if you are just trying to brush out the undercoat or de-shed your dog. Most Golden Retriever owners find that a slicker brush, a dog comb, and an undercoat rake are enough to keep their Golden Retrievers looking at their best. With that in mind, let’s take a look at some of our favorite grooming brushes for Golden Retrievers. One of our favorite de-shedding tools for Golden Retrievers is the Furminator Deshedding Brush for Dogs by DakPets. This slicker brush is great for routine use and also during shedding season when your Golden Retriever is losing fur like crazy. The Furminator is a favorite amongst professional groomers and pet parents alike and promises to help reduce pet hair shedding by up to 95%. It’s made with the comfort of your Golden Retriever’s comfort in mind. This brush will also help your pooch enjoy the brushing routine a bit make, making the task easier on both of you! We also like the Pro Quality Self Cleaning Slicker Brush for Dogs by The Pet Portal. With self-cleaning in the name, you know this slicker brush is going to make brushing your Golden Retriever much easier! Just push the button on the back handle and all that excess fur you just brushed off of your dog falls right out. This slicker brush is also great for any Golden Retriever who is prone to mats and tangles. It helps to easily and painlessly remove mats and tangles without causing damage or irritation to your Golden Retriever’s skin. Another brush we love is the Furminator Firm Grooming Slicker Brush. This is a double-sided slicker brush that, like the Pro Quality Self Cleaning Brush above, helps to remove mats and tangles without pulling or irritating your Golden Retriever’s skin. This brush is especially good for the Golden Retriever as it is made with dogs who have long or medium length fur and double coats. But how about the PawsPamper Extra Wide Undercoat Rake for Medium to Large Dogs? An undercoat rake is an important tool for any double-coated breed. But this particular undercoat rake is one of our favorites for the Golden Retriever. The stainless-steel blades are curved they won’t irritate your Golden Retriever’s skin. What’s more, this product is also a wonderful tool for helping to eliminate mats and tangles. For a finishing tool, we recommend the Andis Premium Pet Grooming comb. This is an excellent finishing tool for fluffing your Golden Retriever’s coat after you are done brushing him. The comb helps to add shine and is also a great tool to help you part your dog’s fur if you think you have found an abrasion on the skin that needs closer inspection. So, now you know the best brush for Golden Retrievers, are you wondering about the brushing process? Brushing your Golden Retriever doesn’t have to be complicated. But it can be difficult if you have a dog who absolutely hates the process. The best way to acclimate your Golden Retriever to brushing is to start when they’re very young. Be sure to use plenty of positive reinforcement, including treats and praise, so your dog will associate brushing with something good instead of something to be feared. If you have an older Golden Retriever on your hands who hates being brushed, don’t worry. You can still teach an old dog new tricks—meaning you can still teach them that brushing is fun. Use the same positive reinforcement methods you would use on a puppy and be patient. Once your Golden Retriever is more used to some gentle brushing, you can start using a slicker brush to remove loose hair. Follow this up with an undercoat rake, before finishing up with the comb. If you stay on top of your Golden Retriever’s brushing routine, you may only need a slicker brush and comb and save the undercoat rake for shedding season. Dying to see how the pros do it? Check out this video of a professional groomer brushing and bathing a Golden Retriever using one of our recommended tools, the Furminator. Golden Retrievers have a double-layer coat that sheds all year round. You can expect more profuse shedding during the fall and summer months. This means your Golden Retriever’s coat will need consistent brushing and upkeep. For the most part, brushing your Golden Retriever once a week is enough to keep loose hair under control. And will help you to maintain their overall coat and skin health. Remember, while your Golden Retriever will need to be trimmed up from time to time, it is important to never shave them. The double layer coat protects your dog not only from the cold but from the heat as well. And try not to skip any days on your regular brushing schedule! Brushing your Goldie is an excellent and fun way to bond with them. The process will not only make your pooch looking great but keep them healthy! So, stay on top of it and have fun! If you love Golden Retrievers, check out our guide to the English Cream Golden Retriever! Do you have any of your own tips or tricks for brushing a Golden Retriever? Or perhaps, a favorite brush? We’d love to hear your thoughts in the comments below.